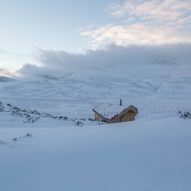 The mountains of Scotland's Cairngorms National Park offer a dramatic backdrop for this modernist-inspired hut by firm Moxon Architects. Culardoch Shieling, which takes its name from the Scottish Gaelic word for "hut", is located in the grounds of the client's highland estate. It provides a space for entertaining guests that takes full advantage of its scenic surrounds. 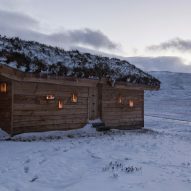 "We were asked to create a building with the highest regard for the very special landscape it is located in" explained Ben Addy, who founded Moxon in 2004, and now has offices in both London and Aberdeenshire. 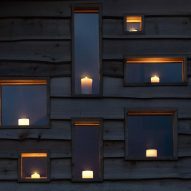 The design was heavily influenced by modernist works of the 20th century. 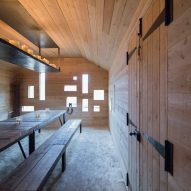 The most obvious are the rectangular glass windows interspersed along the walls of the 47-metre-square hut, which echo those of Le Corbusier's Chapelle Notre Dame du Haut, the iconic cathedral built at Ronchamp in 1954. Moxon also took visual references from humble structures located near to Culardoch Shieling. 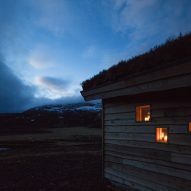 The hut's exterior, which is crafted from unprocessed larch wood, was directly informed by the simplistic aesthetic of livestock holdings and Scottish farming crofts. "In pure terms of construction technology there is nothing much to say that this building could not have been built at any point in the last 300 years or so," said Addy. 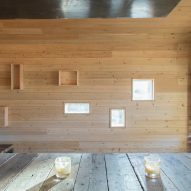 The client specified that the building must have minimal impact on the terrain. "We took this to mean visual and environmental sensitivity in terms of position and form of the building and how it relates to the topography," said Addy. 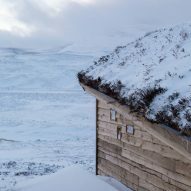 As a result, heather, moss and stone was gathered from local hillsides to cover the roof of the hut, helping to camouflage it. Culardoch Shieling's interior is lined in spruce. 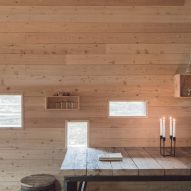 Here, a long dining table facilitates social gatherings, while a wood-burning stove allows the space to be used throughout the winter months. 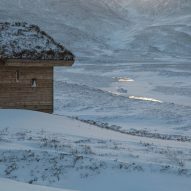 The hut's unusual windows frame specific views, including the peaks of Ben Avon and the curves of the nearby river Gairn. 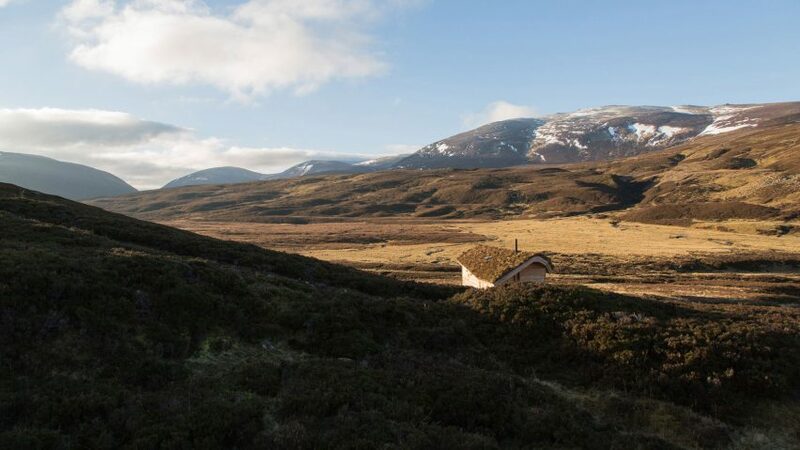 Cairngorms is the largest national park in the British Isles. 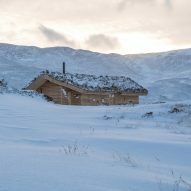 It has been the setting for other projects by Moxon Architects, including a home nestled into a quarry and a restored 18th-century farmhouse with a red metal extension.